Urban Decay's Fall Collection- Urban's new products are out and available for purchase on their website including new tan colors for bases, new shades for lips and new products such as a cream eyeliner and complexion/mascara primer potions. The Mascara Primer Potion. Perhaps good-bye to mascara running and panda eyes? Ammo Plus Primer Set. 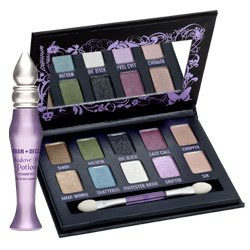 Valued at over $50, you get a full-size Primer Potion and 10 eyeshadow shades for $39.